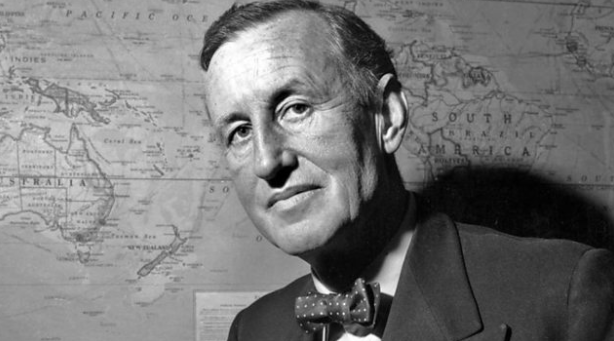 On Monday, August 5 1963, Roy Plomley’s castaway was writer Ian Fleming. The clip – not the full broadcast – is the only extract the BBC have, but it is crystal clear and one of the best audio recordings of Fleming’s voice and thoughts on topics ranging from intelligence work during the war, his stint at The Times and Reuters and of course, his books. He explains his writing process including this systematic approach to his writing routine in Jamaica and how he felt he didn’t have that much in common with his creation apart from a shared love of scrambled eggs. He also touches upon the failed experiment of The Spy Who Loved Me and the production of From Russia, With Love. August 5, 2014 in The Fleming Dossier.